"As an importer, I have three challenges," Don Feinberg says. The first is simple: "We’re always in a state of translation." 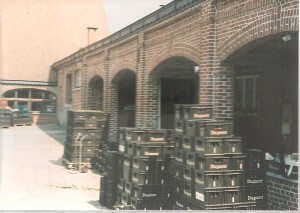 Feinberg is one of the proprietors of Vanberg and DeWulf, an importer of Belgian beer since 1982, including well-known brands such as Dupont and Scaldis. The creative minds at Vanberg agreed to speak with me about the joys, challenges and twists of creating U.S. identities for foreign craft beers. "Whenever possible, we like to use the Belgian identity," he says, but of course that's not always possible or desirable. For example, one of Vanberg's imports, Brasserie Dupont's Foret, is organic, and so in its native language is referred to as "biologique," or "bio." And, understandably, Feinberg feels that, "Bio is not a word that I want to have to market in America." The second is an externally enforced challenge, and one shared by every producer or importer of alcohol in the United States. That, of course, is the group of federal regulations imposed by the Tobacco Tax and Trade Bureau, which regulates alcohol labels. For Vanberg and DeWulf, that includes the place the beer is made, the bottler, the importer, conversions of ounces and milliliters, sometimes a statement of process distilled into familiar TTB language like "beer brewed with ____ and ____," and anything else the bureau feels necessary. The third, though, is where Vanberg and DeWulf starts to get more at the design challenges. "We want the label to match the personality and experience that we think the beer is going to have." This, obviously, is a difficult and ethereal task shared by every label designer, but in the case of importers of traditional Belgian and experimental beers, it's only more difficult. Though bloggers like me may find it boring, there is a reason so many American bottles have flowing rivers or exploding hops on the front; when a beer is driven by a single characteristic virtue, it is easy to communicate that. 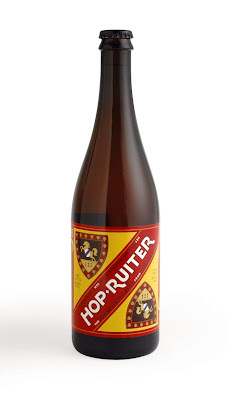 But traditional Belgian beer is defined by balance and a blending of flavors. It's usually designed to be drank in company and with food, and comes from centuries of history and culture with which plenty of even savvy beer drinkers in this country are unacquainted. Feinberg's solution to this is to essentially ignore the label's role as sales piece, and to focus on what he calls the "cultural and informational" function. "We’re trying to communicate, not sell," he says. "We try to talk from the Belgian point of view," he explains. "I'm trying as best I can to squeeze the person’s head through the bottle." The goal is to try to take the drinker to Belgium, rather than translating Belgian beer for American market. That's particularly ironic, since Feinberg's history with Belgium began with the opposite task. From 1979 to 1982, he lived in Belgium, working for an American ad agency, trying to sell Corn Flakes to Belgians. "I’m using that scaffolding," Feinberg explains of his turn to importing, which began in 1982. "But a lot of my training in advertising I use by trying to avoid it." Chuck Robertson, with the New York firm Doyle Partners, has been working with Feinberg for more than 10 years. He has the job of taking what Feinberg tells him about an import, and trying to represent it on a label, while paying homage to a long history. 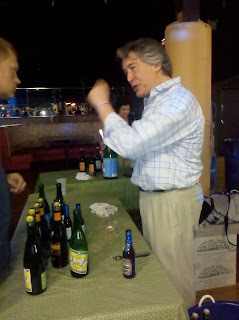 "They come with a personality outside of the beer itself," he explains of the additional challenge. "Many of these beers that are being imported come with a back story." Again using Brasserie Dupont as an example, there is the history of the land, the farms, the family and the brewery. Even if Belgians might be as familiar with that lore as we are with the Budweiser Clydesdales and Busch scion naming conventions, Americans aren't. And so all of that needs to be incorporated into the design. "We tend to try not to characterize the beer so much in the label as the brewer and brewery," Robertson explains. But even then, the goal is to represent the history, not make it more exciting. "We don’t create an elaborate audience characterization... What we tend to like, we hope other people will be attracted to, as well." Okay, so that's hard, but one could argue that it is a similar task to that which faces any creative professional who balances an established craft brand with a new beer. There is another challenge, though. Robertson often has to design a label for a product he has never tried. In fact, the last four labels he has had to design without trying the beer. Whether it comes from Belgium or the depths of Feinberg's imagination (more on that in a second), the beer is often not available in the United States. Having experienced a few minutes of Feinberg's passion for his products, I had to ask if that ever leads to disagreements between the creative minds. "Yes, but we never come to blows," Robertson says, "Often, the misunderstanding comes from a verbal translation." Trying to tell your designer about beer character, to paraphrase an old cliche, is a bit like composing about architecture. So one solution is to use surrogates. Feinberg will ship non-beer products to Robertson that "express similar characteristics," in an attempt to get him something to work with. Another strategy, of course, is trial and error. Robertson and the team will often start with ten to fifteen different labels, just to see if any of them are getting close to the vision. Hard enough when it's a Belgian saison, but what about when it's a type of beer that doesn't even exist yet? 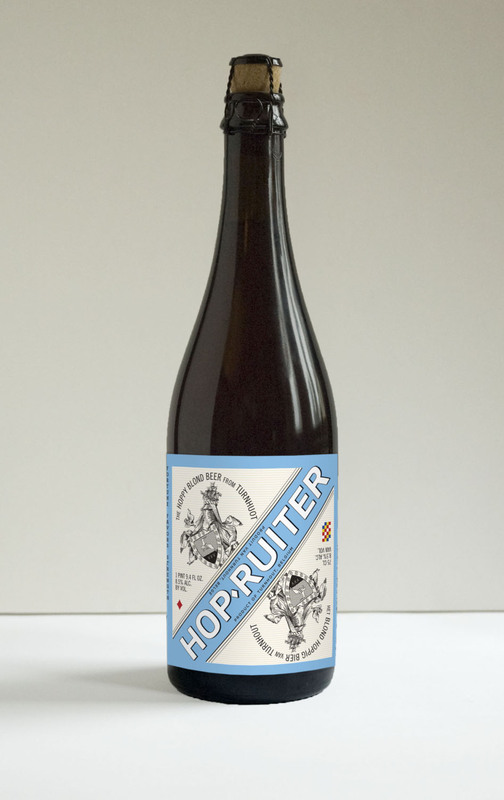 Two recent beers in Vanberg and DeWulf's portfolio, Hop Ruiter and Lambrucha, are creations of Feinberg's mind. And as anyone who has had them is aware, they are difficult to describe. The Hop Ruiter recently took silver at the U.S. Open Beer Championships in the experimental category. Robertson was kind enough to share some of their process work. The yellow and Belgian royal crest motifs suggest a beer with a bright and unconventional flavor, but still one steeped in tradition. There are no enormous, juicy hops adorning the label, like we might see on American Belgian IPAs. Stripes, strong lines, and medieval motifs contrast with the modern lettering, and the fact that the visual label is reversible, like a playing card might be, gives us a sense that there are multiple ways of seeing this beer. "I wanted to make a beer that was 'hoppy' but was 'hoppy' from a Belgian Point of view." Feinberg explains. There was initial resistance to it, because American beer drinkers seeing the word Hop expected something closer to a West Coast IPA. "The flavors I gave them weren’t cascade and Amarillo." According to Feinberg, that led to early misgivings by the online beer rating community, which over time grew to accept the beer for what it is trying to do. 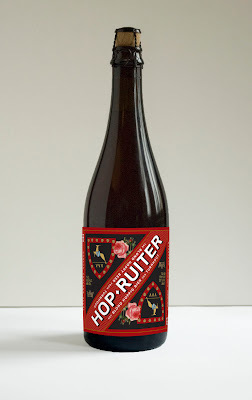 Though one should always be careful of using such things as a metric, the Hop Ruiter currently has a B+ (A- from the brothers) rating on Beer Advocate. The Lambrucha, a 3.5% ABV blend of lambic and two fermented kambucha teas, recently won Gold at the U.S. Open Beer Championship in the experimental category. "Lambrucha was an unusual product because it was… a new beverage category, so we didn’t know what we were going to do," Robertson admits. "We were literally siting in our conference room pouring lambic and tea from the store together to try to approximate the taste." The conversations yielded more questions. "Was it a beer, or was it a tea?" Robertson recalls "Was it a health drink or an aperitif?" Those were existential questions, but they are also technical ones when it comes to the TTB and consumer expectations. For example, the beer label does not tout the beer as a "lambic," for fear that beer drinkers would buy it and be put off by its dissimilarity to other commercially available lambics. "On a label you have to be very careful about what you say," Feinberg says. He recalled a time in the early 1980s when, as a co-founder of Ommegang Brewery, his goal had been to make the labels as Belgian as possible, which led to their often being placed erroneously on the import shelf. From a design standpoint, Robertson settled on a deliberately ambiguous fusion of colors. There is a lion straight out of a traditional Belgian motif, but it has eight arms. There is a shield in the upper left that would be recognizable as Medieval European, but it has Thai writing. The checkerboarding is European in theme, but the bright colors, lotus frame and green and gold border are obviously more at home in Southeast Asian iconography. "It’s the marriage of two cultures, both literally and figuratively," he says, alluding to the wordplay of yeast cultures, along with the joining of European and Southeast Asian cultures. "We were trying to not confuse but see if we could push together two cultures and see if we could create something new," Robertson explains. "You couldn’t quite put your finger on what the design influences were." The brightness of the label does suggest the light, tart flavors one finds in a taste of the Lambrucha. "It has an exuberance and effervescense that the beverage has too," Robertson says. Now, in full disclosure, as a former reporter, this read to me very much like a quote taken a bit out of context. Sometimes when we write features, we look for opposed views and different opinions, and the journalistic instinct can be to use the quotes that best fit that dialectic, even if it makes the speaker seem a bit more one-sided. It's not sneaky or evil, it's just the craft and it can happen to the best writers, especially if it's a niche subject like Belgian beer, where it's not fair to expect reporters to be experts (Fromson referred to a quadrupel as a traditional Belgian ale, when it's nothing of the sort). Well, as beer goes, that's a bit of a story, and I'm into the business end of this industry, so when life put me on the phone with Feinberg, I had to ask about it. Vanberg is a brand and an importer very much proud of authenticity, but what exactly does that concept mean to a person whose last creation was a blend of lambic and fermented Asian tea? "Authentic doesn’t mean ancient, because then you’d never have innovation," Feinberg says, relating it to the old wine concept of terroir, a theory that the very land itself on which grapes are grown lends a unique flavor to the wine. Like in wine, the concept of authenticity in beer can both celebrate a beverage's unique character, but it can also be used to say that no one else can replicate it, something Feinberg is against. "I believe in the concept of terroir... but it can’t become an excuse for exclusivity," he says. When it comes to some of the new Belgian breweries, to Feinberg, the distinction is one of identity versus geography. Think of it this way: is a restaurant in Thailand necessarily a Thai restaurant? Well, maybe, in a grammatical sense, but if it serves burgers and fries, then not in the sense that most people might mean. Likewise, if a brewery in Flanders is making a great American style IPA, it may be making very good beer, but Feinberg and Littlefield would say it is not Belgian in any meaningful sense, other than strictly geographic. "There are a couple brewers in Belgium who are making beer for Americans. We’re interested in Belgium, we’re interested in their traditions," Feinberg says. "There are certain flavors that are true to a type of culture, and if you don’t believe that, you’re one step away from making soda." Feinberg makes it clear that he does not believe new international breweries (like de Struise and Alvinne) are bad or making necessarily bad beer. So I ask him if he feels that Vanberg's focus on traditional authenticity is, well, better. "I think there’s something to be fought for and to be celebrated by being true to yourself. And I think that is better," he says. "If you came to visit me in Belgium, I wouldn’t bring you to the Hard Rock Café." Littlefield also responded to me in an email, saying that she spoke with the author for over an hour, and that she wishes nothing but success for de Struise, Alvinne, and the other startups in Belgium, making the point that "it would be really out of character for someone who has spent a career as a champion of the independents to slam Struise or Alvinne." However, like Feinberg and others, Littlefield would draw a distinction between Belgian and what Stan Hieronymus called global in his response. 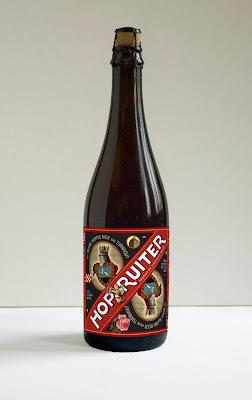 "More often than not the flavor profiles of these [new brewery] beers are not particularly "Belgian" as in balanced and harmonious/subtle," Littlefield wrote. "For Belgian brewing culture to be vibrant and authentic we think it still needs the regional independents with bricks and mortar and employees and community ties and history and stylistic distinctiveness. I think there is a bit of naivete in the beer geek community about the business aspect of the beer world." The increasing challenges that come from a global beer market are just some of the things Feinberg and Littlefield have seen change in the almost three decades of Vanberg and DeWulf's role in the U.S. and Belgian beer markets. As Robertson says, it poses plenty of new questions from a design standpoint alone. Some of the first labels Vanberg did were for Duvel, which at the time they had to change from white to black, because the American beer market at the time associated white labels with cheap beer. "Belgian beers have now been introduced… it’s just not new anymore," Robertson says, noting that there's an increasing balancing act to maintain the artisanal quality and feel of traditional Belgian ales. "Some of the Belgian beers that are being imported and finding a foothold, there’s a potential for them to become more mass-marketed." One thing that has gotten easier, according to Feinberg, is the comfort level the federal regulators now have with the breadth of beer as a product. "20 years ago, if it didn’t fit into 3 or 4 categories, you were down in Washington DC pleading your case." A photo of La Fleur en Papier Dore, by Kyoko Hamada, adorns the Vanberg site. I ask Feinberg, as someone with the perspective of being around Belgian and craft beer about as long as the United States have had a market for it, where he sees the American market trending, particularly with regard to imports. "America’s the home of the extreme," he says, noting that that extremism has changed focus recently. "You’re getting an interest in intensity moving away from hoppiness… into sour, local ingredients." I ask if he shares my belief that the extremism will fade as the beer market matures. "There’s only so much flavor and intensity you can experience, especially if you’re going to drink [the beer] and not just taste it" he says. "I think that’s where part of the whole session beer movement comes from." Ed. note: Session beer is the class of beer with low abv (under 4.5%) and lots of flavor. For those of you new to this blog, I immodestly refer to myself as a low-level lieutenant in the session beer revolution. Feinberg sees the session beer movement as a symptom of a desire for many of the same things that one sees in traditional Belgian ales; a preference for balance, subtlety and (a word that has sadly been made taboo by macrobreweries) drinkability. "This to me is what makes Belgium the heart of a complex brewing culture," Feinberg says. "There’s a lot of intense flavors, but they’re very well balanced. The flavors work together in a harmonious way."